Christmas is really near and you must have started planning on what to do on Christmas. It’s time to decorate your homes with Christmas Decorations, and decorate your christmas tree and arrange christmas hampers and christmas gifts for everyone. If you’re thinking of throwing a Christmas party then it must have an attractive christmas theme to make the party memorable and fun. You might get confused with all the different ideas scattered on the internet so we gathered the best ones up . 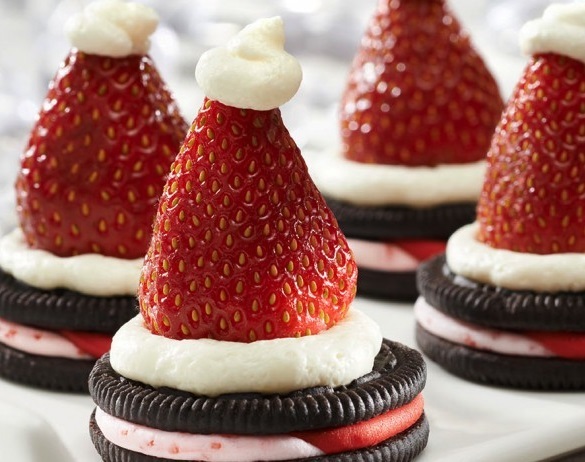 These Christmas Party Ideas will help you keep your Guests entertained and amazed. 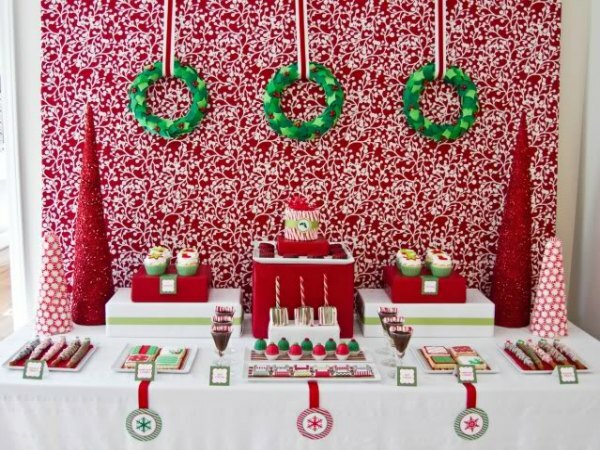 Take a cue from these fabulous ideas and use them this year for your Christmas Party. Christmas party is a nice idea for meeting old friends and family on Christmas eve and celebrate. Here’s some ideas to keep this year’s party a memorable event for your guests. 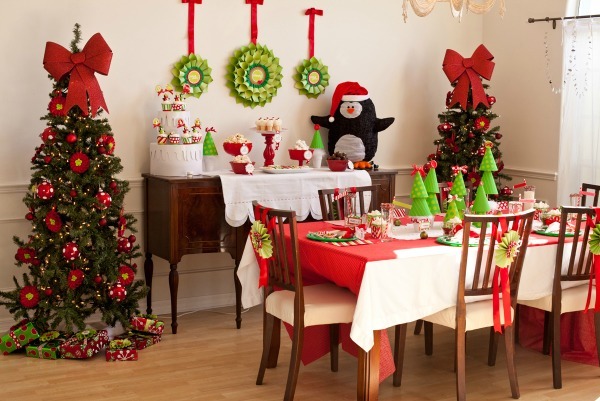 Christmas Party decorations can be New and Modern or Traditional . .Or you may select any other theme. This White and Red decoration goes well with modern themes. The party snacks and sweets are lined across and in steps. 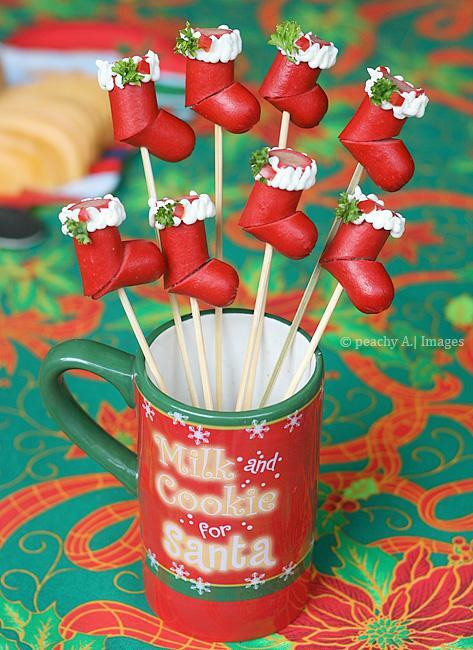 Red ribbons, customised labels and some attractive candy cane decoration make this a great idea to try this year. Christmas Dinner Table or Party table decoration is always an important part of the Christmas party . You can use tried and tested combinations and keep the decorations as traditional as possible. Use green and red decorations. Use cake stands as decorative elements and fill in with Christmas balls and other decorative ornaments. 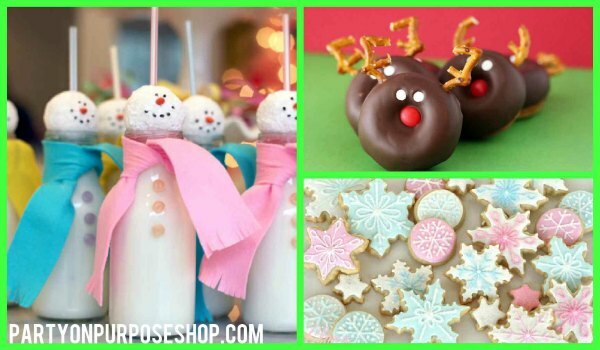 If your party is for kids then this is a great christmas party ideas for kids. Use colorful paper cones in green to make small miniature christmas trees. Use small cake holders to keep the snacks and dessert on display. And don’t for get some holiday themed candies and cupcakes. If you’re planning on a more sophisticated and grand christmas party where you will be having many tables and guests this is a nice way to add some decoration. 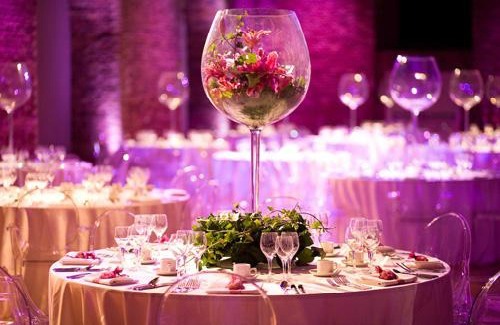 Use large wine glass to hold christmas flowers or decorations and hide the base in greenery. 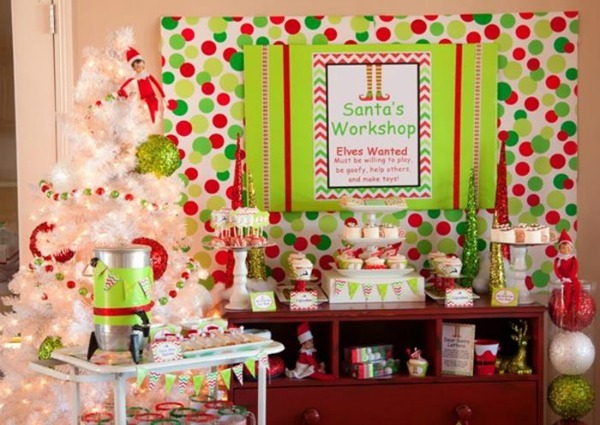 Kids love Santa Clause an it will be a nice idea to give the Santa theme to their Christmas Party for kids. Add some colorful backdrop and add the ‘Santa’s Workshop; Elves Wanted ‘ poster up . 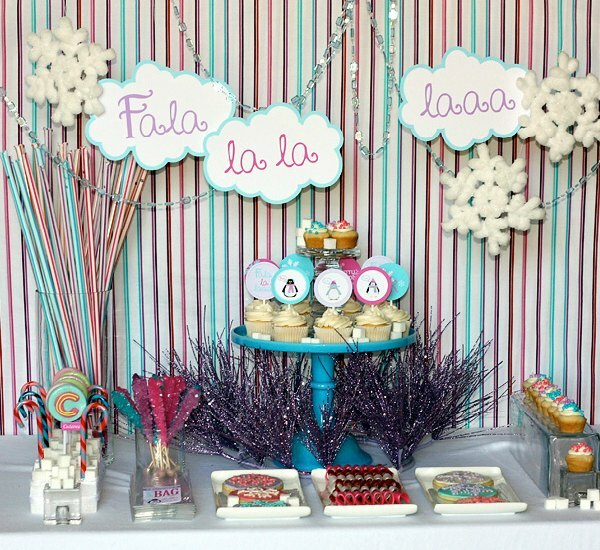 Use cake stands to display your delicious batch of christmas muffins and cupcakes and also display some party favors. This traditional all red and green decoration looks sophisticated and very ‘Holiday’. Use paper wreaths and hang them from the wall, use large glitter paper cones to make christmas tree shapes. 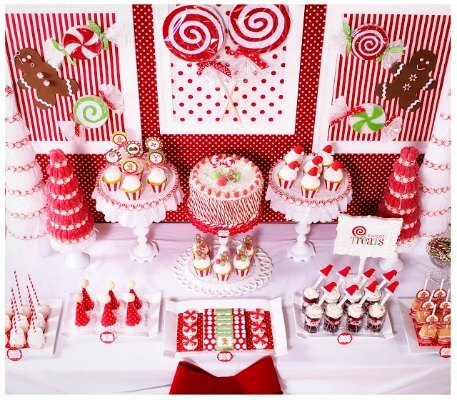 Use different Red and Green decorated desserts and snacks to make the party theme come together. Also use suitable box and display units for each desserts and don’t forget to mention the names of all the items on display. 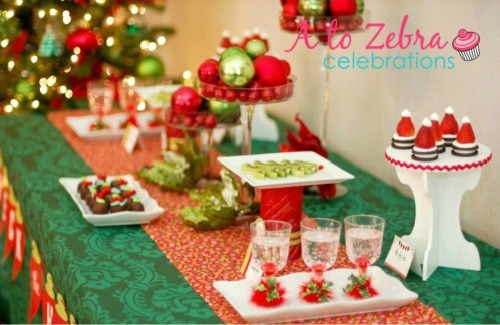 Colorful and very vibrant; this christmas party ideas is a nice and modern approach to a christmas party. You will need to decorate the background with a matching wall decoration or wall paper. Use cake stands and desserts stands to display. 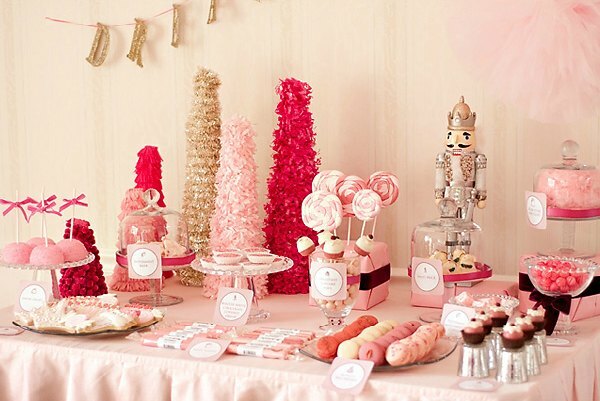 USe candy and lollipops in quirky colors t go with the theme. Also invest in some cute cupcake topper to make them presentable. USe different colorful desserts to make the theme vibrant and lively. If the party is more informal then there are many options to decorate the party table. Choose plates, cups and bottles to go along with the theme. 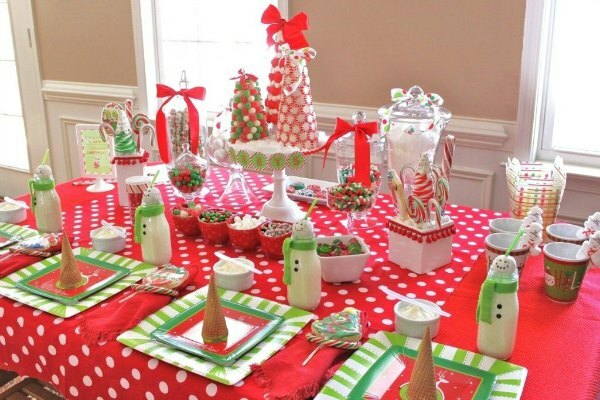 Here we see ice cream cones being used on the plates, milk bottles are decorated with green felt to make them look like snowmen, colorful themed candies and sweet treats are also used to decorate. These snowman milk jugs are perfect for Christmas season and make for perfect items to place on your party table. The chocolate donuts are decorated with cherry, and edible reindeer horns. 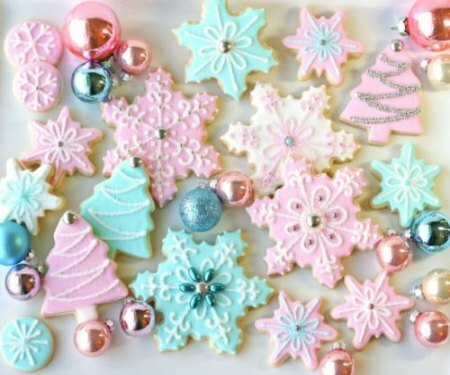 The snowflake cookies are also a great idea for a Christmas party. Winter is here and so is Christmas . It’s that time of the year when you are always seen in your woolens so why not use that as a theme for your party. 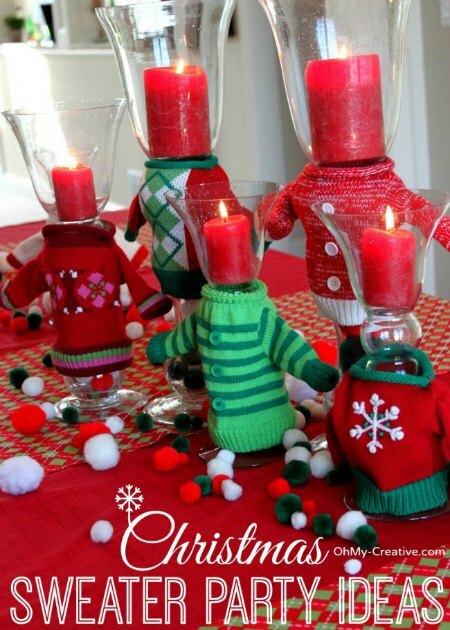 Make small woolen sweaters and use them as the cover for your candle holders. You can also use it for decorating glasses, vases, cups etc. make some easy party snacks with this fool-proof idea. Take some chocolate cream biscuits like Oreo. Top it with some cream and place a cherry bottom up and top it with a blob of cream to make the Kringle cake design. They are easy to make and will be loved by all . 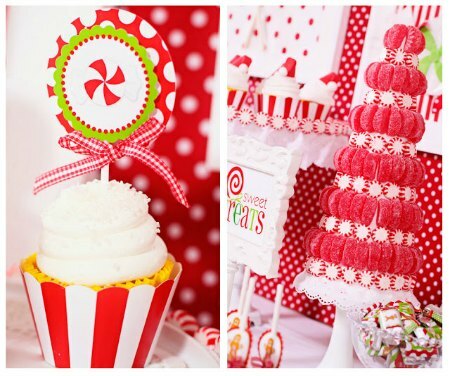 Snowflake cupcakes and Christmas trees are ideal dessert options for Christmas parties. Decorate your cookies with colored frosting and top with sprinkles and decorate. Add different colors and shapes . 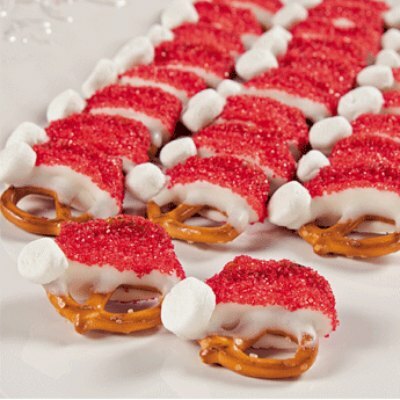 How apt are these Kringle caps for a Holiday Party. These are so attractive and will definitely be a centre of attraction at your Christmas party. 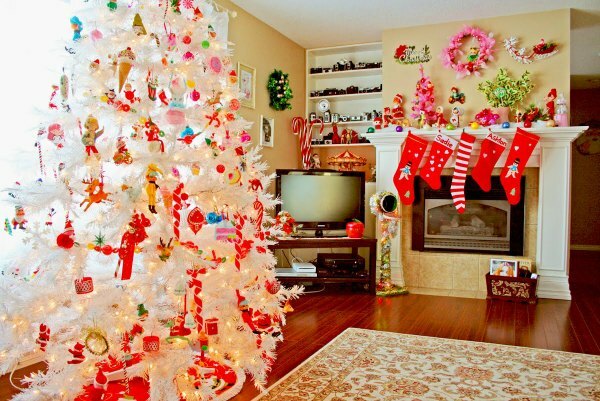 Don’t just decorate a room for the party, you can also doll up the house with a fully decorated christmas tree, stockings, large candy canes and you can use christmas gift ideas or use christmas presents to make the ambience apt for the party. This Christmas Party ideas will surely be appreciated and liked by all. The table here is decorated with different types of desserts and snacks. 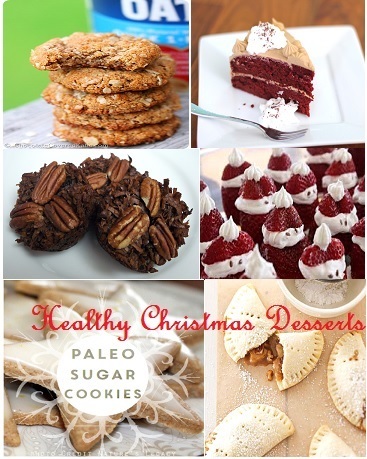 Cupcakes, christmas cookies, muffins, and sweet treats which will be loved by everyone. 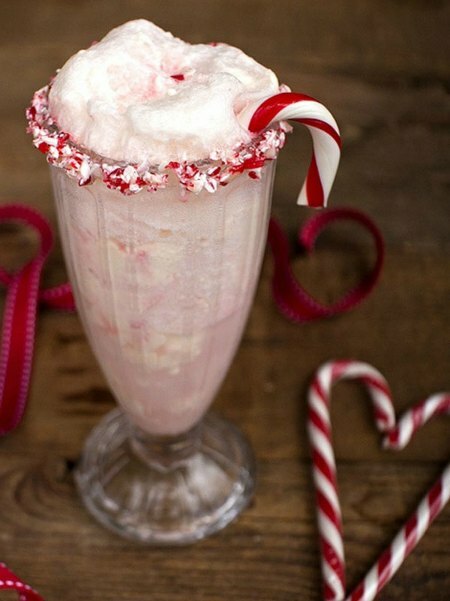 Candy cane inspired shakes and party drinks will surely add fun to your party. Choose your drinks according to your theme like if you’re using a red and white theme a candy cane inspired drink would look nice. 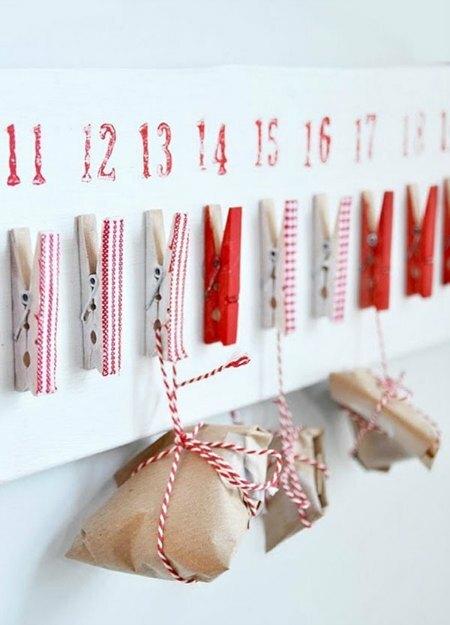 A great idea to use those clothespins and make great holders for those party favors. Attach all the clothespins on the wall and then use washi tape or craft tape to decorate the outer part of the clothespins. Then use simple brown paper and red and white twine to wrap the gifts in and hang them. 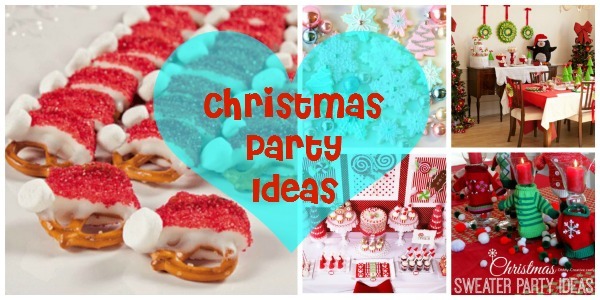 If the party is based on a girly theme or is for kids then this christmas party ideas will work great. 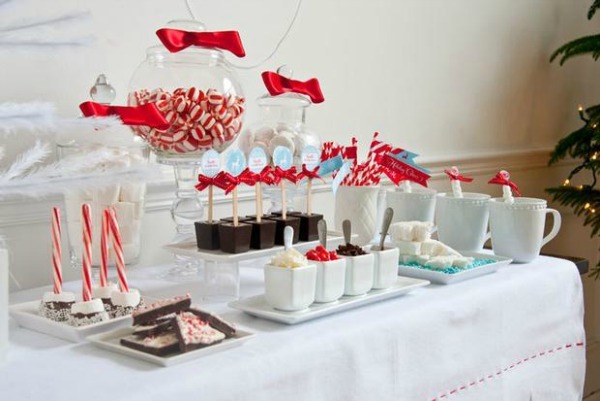 large red and White lollipops are used to decorate. Cupcakes, desserts, muffins, sweet are used for the decoration. Using colorful christmas tree decorations on the tables and matching recipe name cards and cupcake toppers this is a totally Girly party idea. cupcake toppers are a great way to make simple cupcake look attractive. There are many option to choose from so you can select a theme and choose the perfect cupcake toppers to go with it. We hope these ideas have inspired you to try something different this year and make the party memorable for you and your guests.